Disabled yachtsman Keith White has crossed the starting line of his world record attempt to sail non-stop and unassisted around the world. The official start line for Around the World record is a fictitious line between the Lizard Lighthouse and Ushant and Keith crossed it at approximately 4am this morning, 26 October 2015. Keith, originally from London where he learnt to sail on the Thames and Medway, now lives on the Isle of Wight so he can spend more time on the water. Keith lost the use of his left arm in a motorway accident back in 1991. But his disability has not prevented him from living and fulfilling his dreams. In fact it has spurred him on to achieve great things. His boat, Marathon, a Feeling 1350, is only partly modified to accommodate Keith’s physical disability. 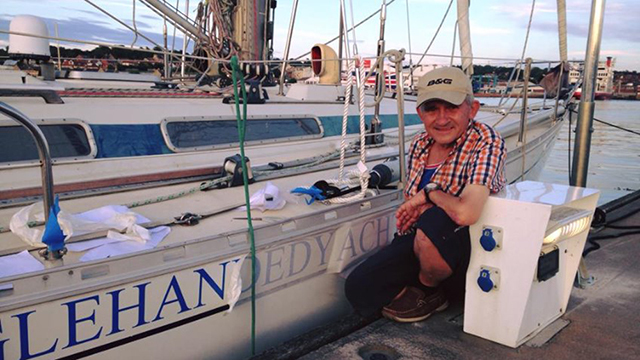 Keith is no stranger to single-handed sailing challenges, having also sailed anticlockwise around the British Isles and across the Atlantic. The journey is estimated to take 10 months, during which time Keith will sail alone, completely isolated from the outside world.